Volatile organic compounds (VOCs) are ubiquitous domestic pollutants. Their role in asthma/allergy development and exacerbations is uncertain. This systematic review investigated whether domestic VOC exposure increases the risk of developing and/or exacerbating asthma and allergic disorders. We systematically searched 11 databases and three trial repositories, and contacted an international panel of experts to identify published and unpublished experimental and epidemiological studies. 8455 potentially relevant studies were identified; 852 papers were removed after de-duplication, leaving 7603 unique papers that were screened. Of these, 278 were reviewed in detail and 53 satisfied the inclusion criteria. Critical appraisal of the included studies indicated an overall lack of high-quality evidence and substantial risk of bias in this body of knowledge. Aromatics (i.e. benzenes, toluenes and xylenes) and formaldehyde were the main VOC classes studied, both in relation to the development and exacerbations of asthma and allergy. Approximately equal numbers of studies reported that exposure increased risks and that exposure was not associated with any detrimental effects. The available evidence implicating domestic VOC exposure in the risk of developing and/or exacerbating asthma and allergy is of poor quality and inconsistent. Prospective, preferably experimental studies, investigating the impact of reducing/eliminating exposure to VOC, are now needed in order to generate a more definitive evidence base to inform policy and clinical deliberations in relation to the management of the now substantial sections of the population who are either at risk of developing asthma/allergy or living with established disease. In westernised countries, asthma and allergic diseases are a public health concern because of their high prevalence, associated morbidity and substantial healthcare and societal costs [1, 2]. The prevalence of asthma and allergic disorders has increased since the early 1960s [3–12] and, although it is generally accepted that changes in the prevalence are a consequence of changing environmental influences, the identities of the relevant environmental exposures remain unclear. Volatile organic compounds (VOCs) are important indoor air pollutants produced by evaporation at room temperature from paints, wood, fabrics, cleaning agents, air fresheners, cosmetics, furnishings and floor and wall coverings. Indoor VOC levels exceed those outdoors [13–15], and are further increased by cigarette smoking and if a garage is attached to a house . Greater use of VOC-containing products has, together with more effective insulation and less external ventilation of modern buildings, contributed to increased VOC exposure. The possible health effects of indoor VOC exposure are a cause for concern, given that people in general, and children in particular, now spend most of their time indoors [14, 17]. Several developments have led to a renewed interest in the possible effects of residential VOC exposure on asthma/allergy. These include the development of technologies that facilitate the quantification of individual VOC exposure, longitudinal cohort studies reporting associations consistent with a link between antenatal VOC exposure and childhood asthma/allergy [18, 19], and new approaches to reducing residential VOC exposure. Interventions to reduce VOC exposure are now feasible by, for example, avoiding redecoration, new furniture, air fresheners and perfumed items, and increasing ventilation . The technology now also exists to construct so-called “nontoxic” houses, which are built without unplasticised polyvinyl chloride (uPVC) frames and using low-VOC paints and coverings. We report here a systematic review investigating the possible effects of domestic VOC exposure on the development of asthma/allergy and the impact of VOCs on those with established disease. We searched the following 11 international databases using a detailed search strategy (supplementary material, appendix 1): MEDLINE (1966–2012), EMBASE (1980–2012), Cochrane Library (1992–2012), LILACS (1986–2012), ISI Web of Science (1970–2012), BIOSIS (1969–2012), Global Health (1987–2012), AMED (1985–2012), TRIP (2003–2012), CAB (1910–2012) and CINAHL (1937–2012). Unpublished data and research in progress were identified using the key Internet-based databases www.clinicaltrials.gov, www.controlled-trials.com and www.anzctr.org.au, and by contacting international experts in the field (supplementary material, appendix 2). The bibliographies of included studies were scrutinised to identify further relevant studies. There were no language restrictions. Observational studies (cross-sectional, case–control and cohort) and intervention studies (randomised controlled trials (RCTs), quasi-RCTs, controlled clinical trials (CCTs), controlled before-and-after (CBA) studies and interrupted time series) were eligible for inclusion; case reports/series and expert opinions were excluded. Papers were included if they investigated the role of domestic (e.g. home, school, day care), objectively measured airborne exposure to VOCs occurring in real-life indoor environments, in the development of asthma/allergy and/or in exacerbating established disease. We therefore excluded papers reporting exposure to VOC sources, modelled or estimated exposure, and experimental exposure under laboratory conditions. Studies reporting only on exposure biomarkers were excluded on the grounds of their wide inter- and intra-individual variability, potential biological instability and because these measures reflect endogenous metabolites and routes of exposure, including those outside the scope of this review (e.g. digestive, dermal) (supplementary material, appendix 3). We also excluded studies that measured residential VOC concentrations to quantify exposure to environmental tobacco smoke. Included studies reported ante- and post-natal exposures and outcomes in children and adults. The main outcomes of interest were: the incidence or prevalence of asthma, atopic eczema/dermatitis and allergic rhinitis/rhino-conjunctivitis; and evidence of allergic sensitisation. Secondary outcomes of interest were measures of increased disease activity by any objective measure (e.g. lung function, symptom scores, exacerbations, medication usage, healthcare utilisation and quality of life). Studies that reported nonspecific symptoms, such as throat/nasal irritation and symptoms associated with sick building syndrome, were excluded. Two researchers independently reviewed titles and abstracts of identified studies, assessed the full text of potentially eligible studies against the inclusion criteria and carried out data extraction using customised forms (supplementary material, appendix 4). Disagreements were resolved through consultation between the two reviewers and discussion with other researchers if needed. The methodological quality was assessed independently by two researchers using the Effective Public Health Practice Project (EPHPP)  for observational and the Cochrane Effective Practice and Organisation of Care (EPOC) criteria  for intervention studies. For each publication, the method(s) used to quantify VOC exposure were assessed for the likelihood of providing a valid quantification of long-term individual domestic VOC exposure. This grading scheme is broadly based on the principle that longer averaging times are less susceptible to the influence of short-term peaks and troughs, and the evidence that area or static sampling can under- or over-estimate personal exposure (table 1) . Due to the substantial heterogeneity in populations, exposures and outcome measures, meta-analysis of the included studies was deemed inappropriate and was not conducted. A descriptive and narrative synthesis of the evidence was therefore undertaken. In interpreting the evidence we preferentially drew, wherever possible, on evidence from experimental studies and observational studies judged to be at low risk of bias. Our searches identified 8455 potentially relevant papers; 852 papers were removed after de-duplication, leaving 7603 unique papers that were subjected to screening. Of these, 53 satisfied our inclusion criteria (fig. 1). Preferred Reporting Items for Systematic Reviews and Meta-Analyses (PRISMA) flow diagram of studies identified to investigate the role of domestic volatile organic compound (VOC) exposure in risk of developing and/or exacerbating asthma and allergic disorders. RCT: randomised controlled trial; CCT: controlled clinical trial; CBA: controlled before-and-after. We found eight interventional studies: one RCT , one CCT  and six CBA studies [25–30]. The majority (n=45) of studies employed observational designs. There were six cohort studies [31–36] and 11 case–control studies [37–47]. Among the observational studies, two-thirds (n=28) were cross-sectional studies [48–75]. 30 studies investigated the role of VOCs in the context of developing asthma/allergy [25, 28, 31, 36, 37, 40–46, 48–54, 57, 59, 61–65, 67–69, 73]; five studies investigated the role of VOCs in exacerbating established asthma/allergy [24, 27, 32, 33, 56]; and the remaining 18 studies investigated the role of VOCs in both the development and exacerbation of asthma/allergy [23, 26, 29, 30, 34, 35, 38, 39, 47, 55, 58, 60, 66, 70–72, 74, 75] (table S1). Five studies, including one RCT , three cohort studies [33–35] and one case–control study , were graded as being at low risk of bias; 15 studies, including two cohort studies [31, 36], five case–control studies [37, 42–45] and eight cross-sectional studies [48, 50, 62, 65, 72–75], were graded as being at moderate risk of bias. The remaining 33 studies were judged to be at high risk of bias (tables S1 and S1A). Six studies examined the association between total VOCs and asthma/allergy-related outcomes [36, 43, 45, 46, 49, 51]. While one cohort study at moderate risk of bias found no associations , two case–control studies at moderate risk of bias reported adverse associations between total VOCs and asthma [43, 45]. There was one further study that measured total VOC exposure but did not relate this to the outcomes of interest . Total VOCs were also investigated in one case–control study  and two cross-sectional studies [49, 51] that were considered to be at high risk of bias (tables S1A and S2). 14 studies explored the associations between the aromatic group of VOCs and asthma/allergy-related health outcomes (table S1A) [31, 37, 40–43, 45, 46, 50, 51, 54, 61, 62, 73]. Among the studies at moderate risk of bias, one cohort study reported a significant association between exposure to benzene and decreased CD4 CD25 regulatory T-cells in cord blood , two case–control studies [43, 45] and two cross-sectional studies [50, 62] reported adverse associations between aromatic VOCs and asthma, wheezing, nocturnal breathlessness and cord blood T-cell parameters, while two other case–control studies [37, 42] and one cross-sectional study  found no association between aromatics and asthma, atopic eczema/dermatitis, allergic rhino-conjunctivitis or sensitisation. Aromatic VOCs were measured in two other studies, but exposure was not related to any of the outcomes of interest [63, 69]. Aromatic VOCs were also investigated in three case–control studies [40, 41, 46] and three cross-sectional studies [51, 54, 61] that were all considered to be at high risk of bias. Two cross-sectional studies at moderate risk of bias examined chlorinated hydrocarbons as a group, or chloroethenes separately, and reported adverse association with wheezing and cord blood T-cell parameters [50, 62]. These types of VOCs were also investigated in two cross-sectional studies that were judged to be at high risk of bias [51, 61]. One case–control study at moderate risk of bias reported adverse associations between propylene glycol and glycol ethers and asthma, rhinitis, eczema and IgE-sensitisation . Another cross-sectional study also investigated this exposure; however, this study was at high risk of bias (table S1A) . Alkanes were investigated in six studies (table S1A) [37, 42, 43, 51, 61, 62]. Three case–control studies at moderate risk of bias reported no associations between alkanes and asthma, atopic dermatitis, allergic rhino-conjunctivitis, sensitisation or nocturnal breathlessness [37, 42, 43]. One cross-sectional study at moderate risk of bias found adverse associations between methylcyclopentane and elevated percentages of interleukin-4-producing type 2 T-cells . The remaining two cross-sectional studies were at high risk of bias [51, 61]. Alcohols were investigated in three cross-sectional studies; all were considered to be at high risk of bias [49, 53, 59]. Two studies, one case–control  and one cross-sectional , at moderate risk of bias, found no association between aldehydes as a class and the outcomes of interest (table S1A). Formaldehyde was the most commonly reported individual aldehyde (17 studies) [25, 36, 40–44, 46, 48, 49, 51, 54, 57, 64, 65, 67, 68]. Among six studies at moderate risk of bias, one case–control study showed no associations with asthma , while one cohort study , two case–control studies [43, 44] and two cross-sectional studies [48, 65] at moderate risk of bias found adverse associations between formaldehyde exposure and asthma, allergic rhinitis, rhino-conjunctivitis, atopic eczema or nocturnal breathlessness. Four studies measured formaldehyde but did not relate exposure to the outcomes of interest [28, 52, 63, 69]. 11 remaining studies [25, 40, 41, 46, 49, 51, 54, 57, 64, 67, 68] on formaldehyde exposure were at high risk of bias. Acrolein was investigated in one cross-sectional study at moderate risk of bias and found to be adversely associated with the prevalence of asthma in the past year in those with atopic asthma but not with nonatopic asthma . A second cross-sectional study also assessed acrolein exposure; however, this study was at high risk of bias . Acetaldehyde was investigated in four studies; all were considered to be at high risk of bias (table S1A) [41, 51, 57, 64]. Ketones were investigated in three studies; all were considered to be at high risk of bias (table S1A) [49, 53, 59]. Terpenes were investigated in two studies at moderate risk of bias [43, 62]. In a case–control study, exposure to limonene was related to bronchial hyperresponsiveness and exposure to α-pinene and carenes (δ2, δ3) to a reduction in peak expiratory flow , while a cross-sectional study failed to relate any of these exposures to allergic sensitisation to food allergens . Terpenes were also investigated in one study that was at high risk of bias (table S1A) . In one cross-sectional study at moderate risk of bias, chloroform as a single compound was associated with wheezing, and methyl t-butyl ether was associated with physician-diagnosed asthma and wheezing . One case–control study at moderate risk of bias also reported that total terpene exposure was linked to nocturnal breathlessness . Two other case–control studies at moderate risk of bias reported no association between exposure to organic acids as a class and asthma, eczema, allergic rhinoconjunctivitis and sensitisation , or between butanols as a class and asthma, sensitisation and lung function . VOCs were also investigated in five other single studies at high risk of bias (table S5) [49, 51–53, 59]. Overall, we found a substantial body of evidence, the majority of which was judged to be at high risk of bias. Whilst it was therefore not possible to draw any conclusive assessment in relation to the aetiological role of VOCs in the development of asthma/allergy, the modest effect sizes and the heterogeneity of findings suggest that VOC exposure is unlikely to be a major risk factor for the development of asthma/allergy in the general population. Total VOCs were investigated but not examined in relation to the outcome, in two studies, both of which were considered to be at high risk of bias (tables S1A and S3) [24, 27]. Total aromatic VOCs were investigated in four studies [27, 32, 33, 56]. One cohort study at low risk of bias reported that exposure to benzene, toluene and ethylbenzene was associated with a decrease in forced expiratory volume in 1 s (FEV1) and with an increase in change of FEV1 . Exposure to these aromatics also leads to an increase in rescue medication and emergency department visits. Two studies measured toluenes [27, 56], two studies measured xylenes [27, 56], and one study measured styrenes , but none of these examined these exposures in relation to the outcomes of interest. These studies were judged as being at high risk of bias [27, 32, 56]. Formaldehyde was investigated in one cohort study at low risk of bias that found no association with asthma/allergic disease exacerbation . Two other studies also measured aldehydes but did not examine exposure in relation to the outcome of interest, and these were furthermore considered to be at high risk of bias [24, 27]. Overall, we found a much smaller body of evidence focusing on investigating the relationship between VOC exposure and asthma/allergy exacerbations in those with established disease. This evidence was highly heterogeneous and therefore inconclusive. Out of eight studies that measured total VOCs, five did not relate exposure to outcomes [26, 29, 35, 58, 72]. The one case–control study at low risk of bias that analysed exposure–outcome relationships found no association ; the remaining two studies that also investigated total VOCs were at high risk of bias (see table S1A) [55, 70]. Four studies measured aromatics [26, 58, 70, 71], two studies measured chlorinated VOCs [26, 58], three studies measured alkanes [58, 70, 72], two studies measured alcohols [35, 38], three studies measured aldehydes [35, 71, 72], two studies measured ketones [35, 38], one study measured terpenes  and one study measured esters , but they did not examine these VOCs in relation to the outcome of interest. Formaldehyde was investigated in 14 studies [23, 30, 34, 35, 39, 47, 58, 60, 66, 70–72, 74, 75]. One RCT with low risk of bias reported adverse associations between formaldehyde and wheezing . One cohort study at low risk of bias found no associations between formaldehyde and wheezing ; in contrast, one case–control at low risk of bias  and two cross-sectional studies at moderate risk of bias [74, 75] showed positive associations between formaldehyde and current asthma severity, wheezing/severity and nocturnal breathlessness (table S1A). Assessment of 2,2,4-trimethyl-1,3-pentanediol diisobutyrate was carried out in two cross-sectional studies. One of these, at moderate risk of bias, did not relate exposure to asthma/allergy-related outcomes , while the second study was at high risk of bias (table S1A) . The key additional insight from this body of work focusing on both asthma/allergy incidence and risk of exacerbation is that there was one well-conducted RCT which found that exposure to low-VOC (formaldehyde)-emitting heating resulted in reduced respiratory symptoms in children with atopic disease, but this had no impact on lung function. No relevant unpublished and/or ongoing studies were identified. 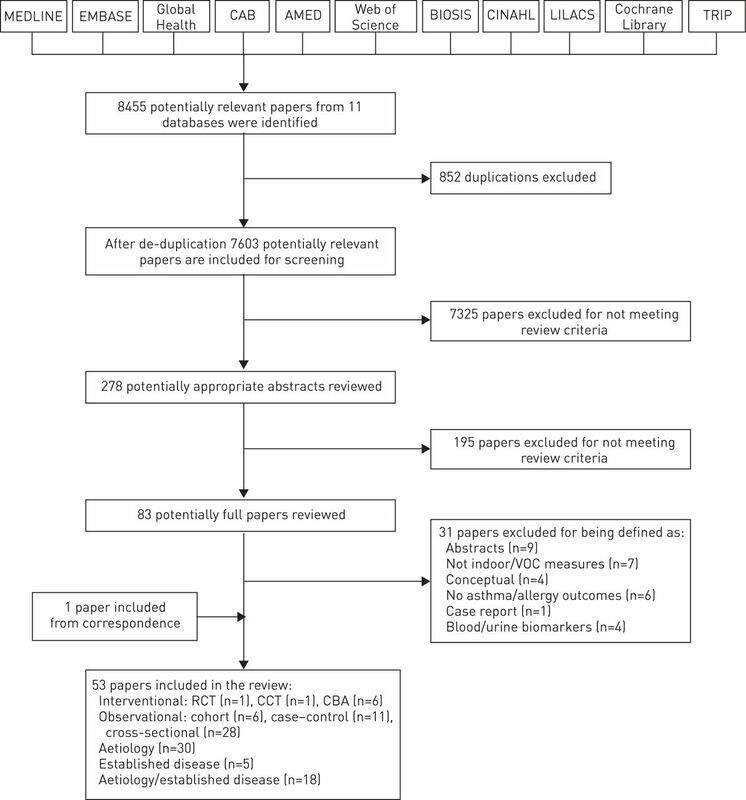 This systematic review is probably the most comprehensive investigation undertaken to date of the role of VOCs in the development of asthma/allergic disease and in exacerbating established asthma/allergy. Most studies investigated the possible role of VOCs in the development of asthma and/or allergic disease, with relatively few studies relating VOCs to exacerbations/severity of established disease. The overwhelming majority of studies employed observational designs, with aromatics and formaldehyde being the main VOCs studied. Critical appraisal of included studies suggested that there was a substantial risk of bias in this body of knowledge. There were approximately equal numbers of studies reporting either adverse associations of various VOCs or no association. Moreover, the numbers of studies supporting and not supporting the associations were also fairly balanced in terms of their methodological quality. In addition, only four of the included studies (one cohort , one case–control  and two cross-sectional [50, 65]) employed exposure assessment methodology that can be considered acceptable in generating the data for exposure–outcome analysis. Given the methodological concerns and the inconsistent results, these data do not provide sufficient evidence to unequivocally support or refute the hypothesis that domestic VOC exposure is associated with an increased risk of developing and/or exacerbating asthma/allergy. A key strength of this systematic review is the comprehensiveness of the searches. We carefully identified all VOCs and then grouped and scrutinised them under several categories to find the effect of each compound on the development of asthma/allergy and exacerbating established disease. The methods used to quantify VOC exposure were carefully assessed and graded for methodological rigour. We note that the existing quality assessment tools do not incorporate assessment of the quality of the exposure information; consequently, studies rated as strong methodologically could have weak methods of quantifying personal VOC exposures. We believe this systematic review to have been more rigorous than the previous, frequently cited, systematic review , critical analysis  and literature review , which notably did not critically appraise study quality using validated tools or distinguish between studies investigating aetiology and those investigating established disease. The main limitations of this review stem from the heterogeneity of populations, exposures and outcomes studied, and the overall limited body of high quality studies. The many limitations of the conducted studies include: inadequate sampling of VOCs at home or in schools; exposure assessment tending to be short-term (typically ≤24 h) and carried out by area sampling with very few personal sampling studies over extended periods; lack of standardisation in assessing asthma/allergy-related health outcomes; measurement of many VOCs that were not related to relevant health outcomes of interest; frequent inadequate adjustment for confounding factors; failure to adjust for clustering; failure to distinguish between disease aetiology, severity and treatment of established disease; and failure to adjust for or consider the consequence of multiple tests of statistical comparison. A potent source of indoor VOC exposure is environmental tobacco smoke, and a further limitation of our methodology was the deliberate exclusion of studies that had utilised VOC measurements as a proxy measure for environmental tobacco smoke exposure, because the focus of this study was residential VOC exposure from noncigarette sources. Notably, some studies failed to adjust for the smoking habits of household members. Animal studies demonstrate that VOC exposure can influence the immune responses, increasing T-helper cell (Th) type 2 polarisation [79–81]. In humans, increased Th2 polarisation of neonatal immune responses has been associated with maternal VOC exposure during pregnancy . Although little evidence exists suggesting that VOCs influence lung growth, embryotoxic effects from exposure to airborne VOCs on murine embryonic stem cells have been reported , and adverse effects on rat embryo/fetal development have been linked to VOC release from their cages . Asthma and allergic diseases are a significant burden to the health services of industrialised countries and a potential threat to the health services of developing countries. The identification of environmental exposures that increase the risk of developing these conditions or exacerbating established disease is warranted. Whether VOCs have adverse effects on asthma/allergy is important to ascertain, given that intervention to reduce VOC exposure is feasible by lifestyle changes (e.g. avoiding redecoration, air fresheners and perfumed items; having a smoke-free home; increasing ventilation) and technological adaptation (e.g. use of low-emitting VOC materials). Despite the aforementioned shortcomings in the underpinning evidence base and the inconsistent findings, this work has demonstrated that it is not yet possible to exclude the possibility that VOCs, particularly aromatics, aldehydes (formaldehyde), alkanes and terpenes, may play a harmful role in the development of asthma/allergy and/or in exacerbating established disease. Further work is required to clarify the impact of VOCs on the development/exacerbation of asthma/allergy. In the first instance, there is a need for well-designed, large cohort studies relating long-term, indoor, personal exposure measurements to validated asthma/allergy-related health outcomes with adequate adjustment for key potential confounding factors and effect modifiers. These observational studies may then need to be followed by well-conducted RCTs investigating the effectiveness and cost-effectiveness of interventions reducing VOC exposure on the risk of developing asthma/allergy and/or exacerbating established disease. The overall body of evidence in relation to the role of VOCs in the development of asthma and allergic disease and the role of VOCs in exacerbating established asthma/allergy in children and adults is weak. We found very few interventional studies and data were generally of poor quality, being derived mainly from observational studies. There is a need to develop a more definitive evidence base to examine the relationship between VOC exposure and asthma/allergy, in order to inform deliberations on public policy and clinical care. We would like to thank Marshall Dozier (The University of Edinburgh, Edinburgh, UK) for her advice on the literature searches. We acknowledge the contribution of an international panel of experts and thank them for providing information on unpublished/ongoing studies. Our thanks also go to Anna Wierzoch (The University of Edinburgh) for administrative support. Support statement: This work was funded in its entirety by a project grant awarded by the Chief Scientist's Office of the Scottish Government Health Dept (CZG/2/573). The funding source had no role in the study design, data collection, analysis, and interpretation, in preparation of the manuscript, or the decision to submit it for publication. Costs of asthma in the United States: 2002–2007. J Allergy Clin Immunol 2011; 127: 145–152. Estimating the economic burden of food-induced allergic reactions and anaphylaxis in the United States. J Allergy Clin Immunol 2011; 128: 110–115. Trends in the epidemiology of asthma in England: a national study of 333 294 patients. J R Soc Med 2010; 103: 98–106. Incidence and prevalence of multiple allergic disorders recorded in a national primary care database. J R Soc Med 2008; 101: 558–563. Trends in the epidemiology and prescribing of medication for allergic rhinitis in England. J R Soc Med 2008; 101: 466–472. The trends in allergic disorders in the UK. Thorax 2007; 62: 91–96. Morbidity and cost of atopic eczema in Australia. Australas J Dermatol 2004; 45: 16–22. Respiratory symptoms and atopy in Aberdeen schoolchildren: evidence from two surveys 25 years apart. BMJ 1992; 304: 873–875. Continuing increase in respiratory symptoms and atopy in Aberdeen schoolchildren. BMJ 1996; 312: 34. Respiratory symptoms and atopy in children in Aberdeen: questionnaire studies of a defined school population repeated over 35 years. BMJ 2004; 329: 489–490. Two main subtypes of wheezing illness? Evidence from the 2004 Aberdeen schools asthma survey. Pediatr Allergy Immunol 2008; 19: 7–12. Surveillance for asthma – United States, 1980–1999. MMWR Surveill Summ 2002; 51: 1–13. United States Environmental Protection Agency. An Introduction to Indoor Air Quality (IAQ). Volatile Organic Compounds (VOCs). www.epa.gov/iaq/voc.html Date last updated: July 9, 2012. Indoor air quality and respiratory health of children. Paediatr Respir Rev 2007; 8: 281–286. Indoor air pollution: a global health concern. Br Med Bull 2003; 68: 209–225. Residential exposure to volatile organic compounds and asthma. J Asthma 2004; 41: 259–270. Time spent in the home by different family members. Environ Technol 1997; 8: 605–614. Frequent use of chemical household products is associated with persistent wheezing in pre-school age children. Thorax 2005; 60: 45–49. Association between indoor renovation activities and eczema in early childhood. Int J Hyg Environ Health 2006; 209: 241–247. Effective Public Health Practice Project (EPHPP). Quality assessment tool for quantitative studies. www.ephpp.ca/tools.html Date last accessed: December 13, 2012. Personal exposure monitoring of particular matter, nitrogen dioxide, and carbon monoxide, including susceptible groups. Occup Environ Med 2002; 59: 671–679. Respiratory health effects of exposure to low-NOx unflued gas heaters in the classroom: a double-blind, cluster-randomized, crossover study. Environ Health Perspect 2010; 118: 1476–1482. The 3-year follow-up study in a block of flats – experiences in the use of the Finnish indoor climate classification. Indoor Air 2003; 13: 136–147. Comparison of health of occupants and characteristics of houses among control homes and homes insulated with urea formaldehyde foam. II. Initial health and house variables and exposure–response relationships. Environ Res 1988; 45: 156–178. Comparison of multiple environmental factors for asthmatic children in public housing. Indoor Air 2003; 13: 18–27. Effect of polyurushiol paint on indoor air quality and atopic dermatitis. Korean J Dermatol 2010; 48: 198–205. Respiratory symptoms, perceived air quality and physiological signs in elementary school pupils in relation to displacement and mixing ventilation system: an intervention study. Indoor Air 2011; 21: 427–437. Chemical and microbial exposures in a school building: adverse health effects in children. Arch Environ Health 2004; 59: 194–201. Exposure to gaseous formaldehyde induces IgE-mediated sensitization to formaldehyde in school-children. Clin Exp Allergy 1996; 26: 276–280. Maternal exposure to air pollution before and during pregnancy related to changes in newborn’s cord blood lymphocyte subpopulations. The EDEN study cohort. BMC Pregnancy Childbirth 2011; 11: 87. Effects of indoor painting and smoking on airway symptoms in atopy risk children in the first year of life results of the LARS-study. Leipzig Allergy High-Risk Children Study. Int J Hyg Environ Health 2000; 203: 23–28. Airways changes related to air pollution exposure in wheezing children. Eur Respir J 2012; 39: 246–253. Long-term exposure to indoor air pollution and wheezing symptoms in infants. Indoor Air 2010; 20: 159–167. New ventilation systems at select schools in Sweden – effects on asthma and exposure. Arch Environ Health 2000; 55: 18–25. Incidence of asthma diagnosis and self-reported allergy in relation to the school environment – a four-year follow-up study in schoolchildren. Int J Tuberc Lung Dis 2001; 5: 1059–1066. Common household chemicals and the allergy risks in pre-school age children. PLoS One 2010; 5: e13423. Mikrobielle flüchtige organische Verbindungen in der Raumluft: Ein neuer diagnostischer Ansatz bei feuchten und verschimmelten Wohnräumen? [Microbial volatile organic compounds: a new approach in assessing health risks by indoor mould?] Zbl Hyg 1995; 197: 504–515. Increased risk of allergy in children due to formaldehyde exposure in homes. Allergy 1999; 54: 330–337. Indoor air quality, environmental tobacco smoke and asthma: a case control study of asthma in a community population. Indoor Built Environ 2005; 14: 215–219. Indoor air pollution and childhood asthma: variations between urban and rural areas. Indoor Air 2010; 20: 502–514. A case–control study: exposure assessment of VOCs and formaldehyde for asthma in children. Aerosol Air Qual Res 2011; 11: 908–914. Asthmatic symptoms and volatile organic compounds, formaldehyde, and carbon dioxide in dwellings. Occup Environ Med 1995; 52: 388–395. Domestic exposure to formaldehyde significantly increases the risk of asthma in young children. Eur Respir J 2002; 20: 403–408. Association of domestic exposure to volatile organic compounds with asthma in young children. Thorax 2004; 59: 746–751. IPEADAM study: indoor endotoxin exposure, family status, and some housing characteristics in English children. J Allergy Clin Immunol 2006; 117: 656–662. Effects of volatile organic compounds, damp, and other environmental exposures in the home on wheezing illness in children. Thorax 2003; 58: 955–960. Poor air quality in classrooms related to asthma and rhinitis in primary schoolchildren of the French 6 Cities Study. Thorax 2012; 67: 682–688. The relationship between exposure to microbial volatile organic compound and allergy prevalence in single-family homes. Sci Total Environ 2012; 423: 18–26. Association between personal exposure to volatile organic compounds and asthma among US adult population. Int Arch Occup Environ Health 2007; 80: 711–719. Quantitative assessments of indoor air pollution and respiratory health in a population-based sample of French dwellings. Environ Res 2011; 111: 425–434. [Risk factors of the intra-housing environment to human health.] Gig Sanit 2005; 1: 11–12. Determination of selected microbial volatile organic compounds by diffusive sampling and dual-column capillary GC-FID – a new feasible approach for the detection of an exposure to indoor mould fungi? J Environ Monit 1999; 1: 445–452. Indoor air pollutants and immune biomarkers among Hungarian asthmatic children. Arch Environ Health 2003; 58: 337–347. Indoor air quality and respiratory symptoms in Porto schools. Rev Port Pneumol 2008; 14: 487–507. Evaporative gasoline emissions and asthma symptoms. Int J Environ Res Public Health 2010; 7: 3051–3062. Qualité de l'air intérieur dans les écoles et asthme et allergies parmi les écoliers en Auvergne. Différences entre le milieu rural et le milieu urbain. [Indoor air quality at school and allergy and asthma among schoolchildren. Differences between rural and urban areas.] Revue Francaise d'Allergologie 2011; 51: 419–424. Indoor air pollution and its impact on children under five years old in Bangladesh. Indoor Air 2007; 17: 297–304. Indoor molds, bacteria, microbial volatile organic compounds and plasticizers in schools – associations with asthma and respiratory symptoms in pupils. Indoor Air 2007; 17: 153–163. Chronic respiratory effects of indoor formaldehyde exposure. Environ Res 1990; 52: 117–125. Enhanced in vivo IgE production and T cell polarization toward the type 2 phenotype in association with indoor exposure to VOC: results of the LARS study. Int J Hyg Environ Health 2001; 204: 211–221. The influence of maternal exposure to volatile organic compounds on the cytokine secretion profile of neonatal T cells. Environ Toxicol 2002; 17: 203–210. Influence of indoor decoration pollution on children’s health. J Environ Health 2010; 27: 1077–1079. Indoor formaldehyde and acetaldehyde levels in the province of Bari, South Italy, and estimated health risk. J Environ Monit 2009; 11: 955–961. Ambient formaldehyde levels and allergic disorders among Japanese pregnant women: baseline data from the Osaka maternal and child health study. Ann Epidemiol 2008; 18: 78–84. Current asthma and respiratory symptoms among pupils in Shanghai, China: influence of building ventilation, nitrogen dioxide, ozone, and formaldehyde in classrooms. Indoor Air 2006; 16: 454–464. Indoor air pollutants in schools: nasal patency and biomarkers in nasal lavage. Allergy 2000; 55: 163–170. Indoor formaldehyde exposure and airway allergic diseases. Int Rev Allergol Clin Immunol 1999; 5: 65–69. Egyes lakoteri tenyezok szerepe iskolas gyermekek legzoszervi panaszainak es allergias tuneteinek gyakorisagaban. [Role of some indoor factors in the prevalence of respiratory symptoms and allergy among school-children in six towns of Hungary.] Egeszsegtudomany 1999; 43: 196–208. Asthma among secondary schoolchildren in relation to the school environment. Clin Exp Allergy 1997; 27: 1270–1278. Prevalence of plastic additives in indoor air related to newly diagnosed asthma. Indoor Built Environ 2008; 17: 455–459. Asthma and the indoor environment: the significance of emission of formaldehyde and volatile organic compounds from newly painted indoor surfaces. Int Arch Occup Environ Health 1997; 69: 115–124. Effect of indoor air pollution related to traffic and fuel gas using for cooking on respiratory diseases in children and teenagers in urban area of Shanghai. J Environ Health 2010; 27: 244–247. Indoor air pollutants and health in the United Arab Emirates. Environ Health Perspect 2012; 120: 687–694. Asthmatic symptoms among pupils in relation to microbial dust exposure in schools in Taiyuan, China. Pediatr Allergy Immunol 2008; 19: 455–465. Levels of pollutants in indoor air and respiratory health in preschool children: a systematic review. Pediatr Pulmonol 2009; 44: 231–243. A review on human health perspective of air pollution with respect to allergies and asthma. Environ Int 2013; 59: 41–52. Associations between in utero exposure to airborne emissions from oil and gas production and processing facilities and immune system outcomes in neonatal beef calves. Arch Environ Occup Health 2009; 64: 59–71. Modulation of neurological related allergic reaction in mice exposed to low-level toluene. Toxicol Appl Pharmacol 2007; 222: 17–24. Effect of long-term exposure to low-level toluene on airway inflammatory response in mice. Toxicol Lett 2007; 168: 132–139. An effort to test the embryotoxicity of benzene, toluene, xylene, and formaldehyde to murine embryonic stem cells using airborne exposure technique. Inhal Toxicol 2009; 21: 973–978. Evaluation of embryo-fetal development in rats housed in concrete or hwangto cages during pregnancy. Birth Defects Res B Dev Reprod Toxicol 2008; 83: 32–39.